Maybe you caught the bug during the Olympics. Maybe you caught the bug during childhood. Or maybe you’re just thinking about catching it. What’s the bug? Volleyball. And once you’ve caught it, you’re in for a heck of a ride with amazing matches and competition. Unless you’ve been around volleyball for some time, there may be some things you just don’t know about the game. No problem. We’d love to help you out. 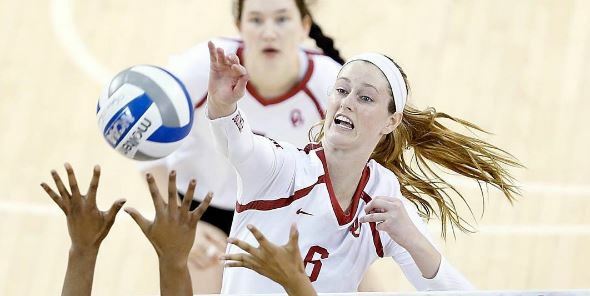 The Lady Sooners play at the OU Fieldhouse. The Fieldhouse is one of the most historic buildings on campus and is very centrally located. With a bench 19 players deep, you’ll definitely want to get to know the ladies setting up the plays for the Sooners. Get to know them here. Now that you’ve caught the bug, be sure to feed the fever with the OU Sooners Volleyball social media accounts – both Twitter and Instagram. A volleyball match is played as a best out of 5 sets with games rally scoring to 25 and winning by two points. How long a game goes is completely dependent on the point spread, the lengths of volleys, and how many sets are required to finish the match. For more info on the game’s basic rules, check this out. Volleyball has 6 players on the court at all times. They occupy the following positions: Outside Hitter, Middle Blocker, Right Side Hitter, Setter, Libero (she wears the opposite color jersey), and Defensive Specialist. Check the Roster to see who fills which positions and watch for them! You’ll hear words like “ace”, “block”, “sideout”, “dig”, “kill”, “dump”, and “stuff”. Get up on the lingo here. Northern Illinois at Dekalb, Ill.
Seton Hall at Orange, N.J.
Kansas State * at Manhattan, Kan.
Texas * at Austin, Texas . West Virginia * at Morgantown, W. Va.
Kansas * at Lawrence, Kan.
And while you’re diggin’ the OU Volleyball team, we’d love to set you up for success with a great night’s rest and a gourmet breakfast at the Montford Inn, located just blocks from the OU Campus. As the preferred destination for University guests, we’d be honored if you’d join us while you’re in town.